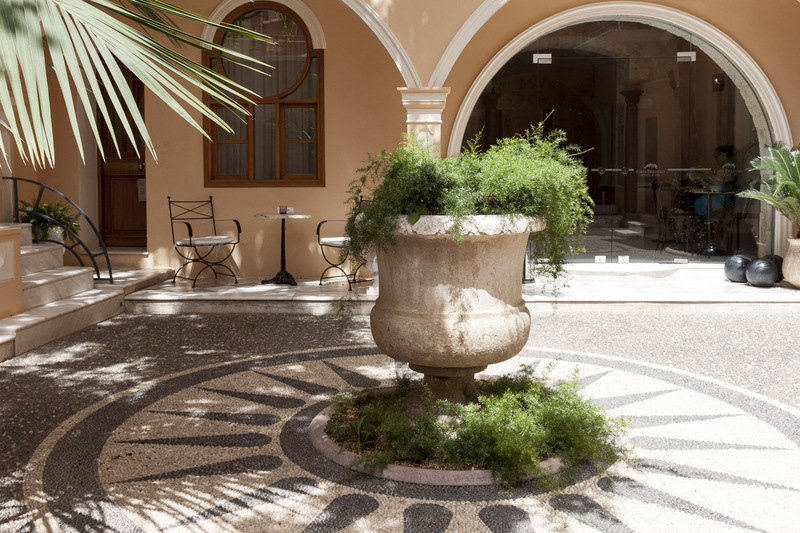 I said I would say more about my stay at the Casa Delfino hotel in Chania, so here it is. First a bit of background. I saw this hotel last year and was attracted to it – it looked very inviting, and definitely up-market and luxurious. It’s deep in the heart of the Old Town near the western end of the harbour, and seems to occupy a complete block – there are entrances to it all over the place. Through one of the gates a beautiful courtyard was visible. 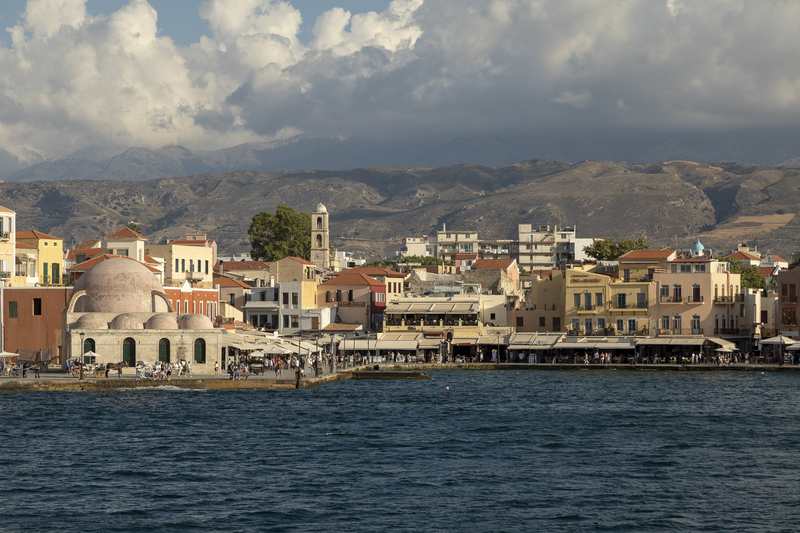 When I planned this year’s trip I decided to spend most of it elsewhere in Crete but finish with a couple of nights in Chania. I remembered Casa Delfino, made an enquiry, and booked one of their smaller room for two nights. Initially I came away with slightly mixed feelings, but on reflection that may have been because I was on my own. Thinking about it, I get the feeling that hotels like this are for couples – or families – who are looking for a high-quality experience that they can enjoy together. They’re not really looking for a more social time. As a result I felt a little lonely – I wasn’t able to strike up any conversations with any of the other guests – but had I been with Val I think we would have been able to relax and enjoy each other’s company in the beautiful surroundings. It’s also the case that it was very hot while I was there – 40º on one day – and this inevitably curtailed the use of the outdoor, communal areas. 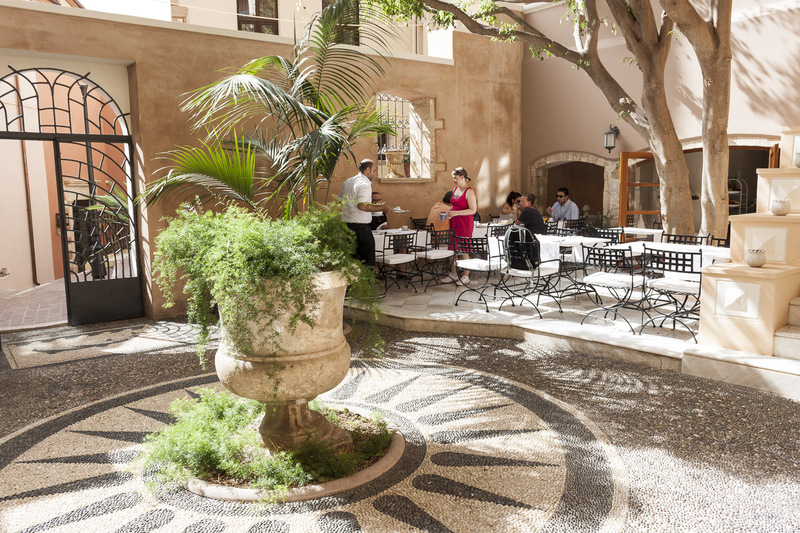 That beautiful courtyard was just as beautiful as I remembered but was also very warm, even in the shaded areas, and the unshaded roof terrace was deserted. The rooms and indoor public areas were air-conditioned and therefore wonderfully cool and refreshing. So if those are the reservations, what are the positives? Well, the hotel’s website says that “Today, the building’s rich and colourful heritage is as much a trademark of Casa Delfino as the exceptional hospitality and elegant interiors“, and to a great extent that’s true. The service was exemplary; the accommodations were superb, even in a basic room – the suites must be amazing; the setting and location is wonderful; and the breakfasts were excellent. I also had a spa treatment which was a definite highlight. Any reservations I had are probably due to the fact that I wasn’t their ideal customer, being on my own. I think that if I’d been with Val it would have been perfect. All of that said – it was not cheap, even for a basic room. It’s a high-quality experience, but also an expensive one. Best in short, concentrated doses. So today I’m heading home. This has led to some complications. My flight isn’t until 8:50 tonight and I had to check out of the hotel at 1pm. However, they’re letting me loiter around the hotel reception area (which is air-conditioned), so that’s helpful. 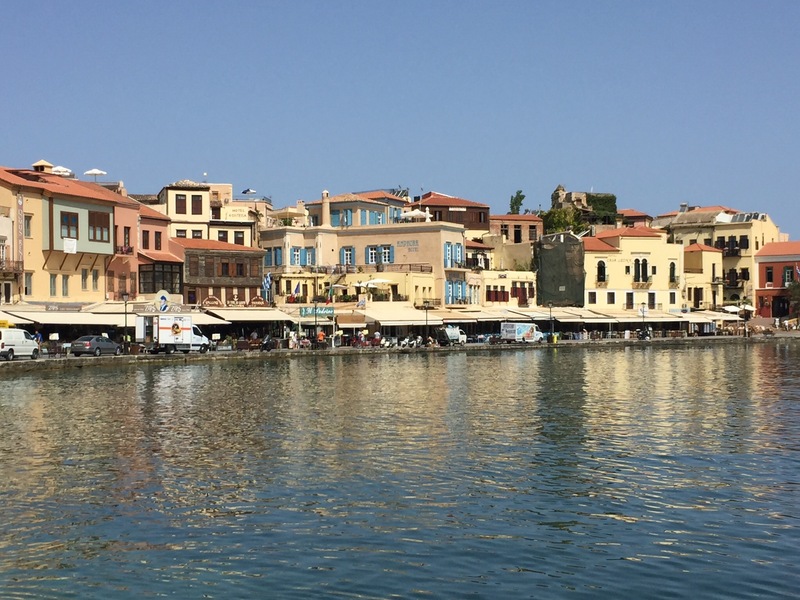 I had a last wander round Chania before checking out. I’ve also decided to not bother with the transfer to the airport that I’ve already paid for. I would have had to get to the bus station, which would have cost €7 or €8 in a taxi – it’s far too hot to think about walking, especially with my luggage. It turns out that a taxi all the way to the airport is only €25, and given that it will be much easier, that’s what I’m going to do. So the flight is at 8:50pm Greek time, and from push-back at Chania to doors open at East Midlands it’s scheduled to take 4h 15m. Take off the two hours time difference, and I’ll be landing at just after 11pm UK time. Then I’ll sample the delights of the East Midlands airport Premier Inn for the night, before finally getting home some time tomorrow morning. 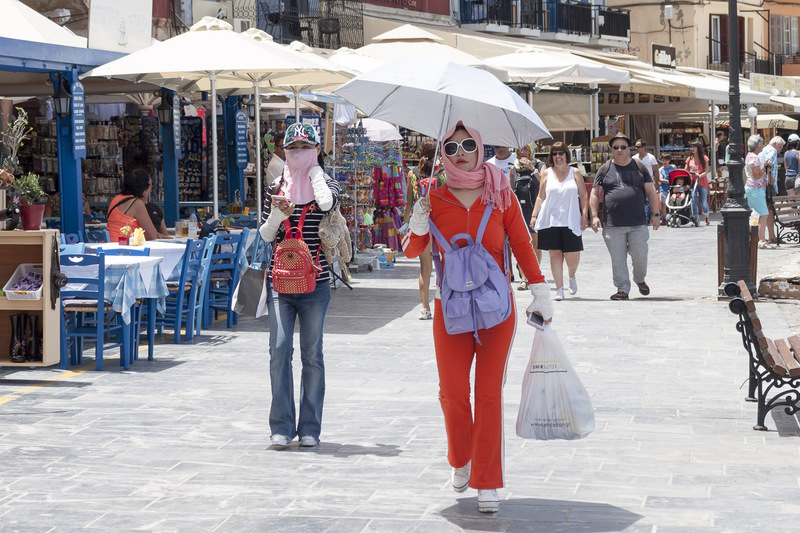 I’ve been in Chania today, where it has been very hot. 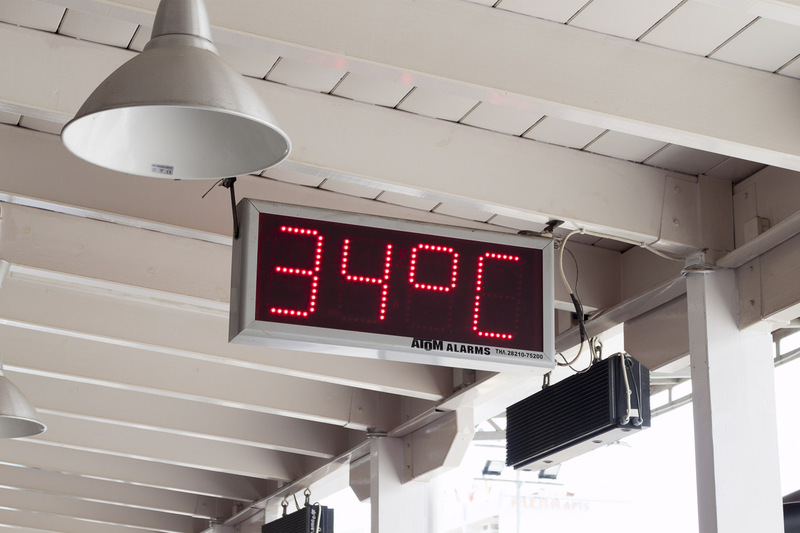 The image above was taken at the bus station at about 10:40, and of course it got hotter thereafter. It was forecast to reach over 40° in mid-afternoon, and I can fully believe it did. So I just wandered around this morning, with frequent breaks for water and eventually lunch. In the end I decided that I was so hot I might as well go exploring, and I found a stretch of the Byzantine Walls that are being restored/conserved. I read up on them a bit – ‘Byzantine’ put them back into the 7th to 12th centuries, but I discovered that parts of them are older than that. Some of of the lower courses are eastern Roman Empire (4th to 6th centuries), and the lowest courses of all date from the Hellenistic period (pre-Roman) and in fact re-used stones from an even earlier settlement, Kydonia. So there are bits of that wall dating back 2,500 years. I also found a few other bits of picturesque older Chania. Then at about 2:30 I went back to the hotel for a few hours, away from the heat. After that I went back out and toured round the leather goods shops. At one point I spotted some Japanese women, all dressed up very strangely- the image alongside is of two of them. Cos-play, I wonder? Whatever their reason, I couldn’t help feeling that they must have been very hot in those outfits. I finished this excursion with a beer. Then it was back to the hotel to shower and change for the evening. I ate in Kritamon again, and afterwards wandered along the harbour. Right at the far end there was a band playing outside the Mediteranean Architectural Centre, which also meant it was also playing alongside a local restaurant, and the diners there didn’t seem to be the band’s biggest fans. Then it was on to Noma for a last drink, and back to the hotel at just after 11:30. Even at 11 o’clock some of the restaurants were still full of diners. 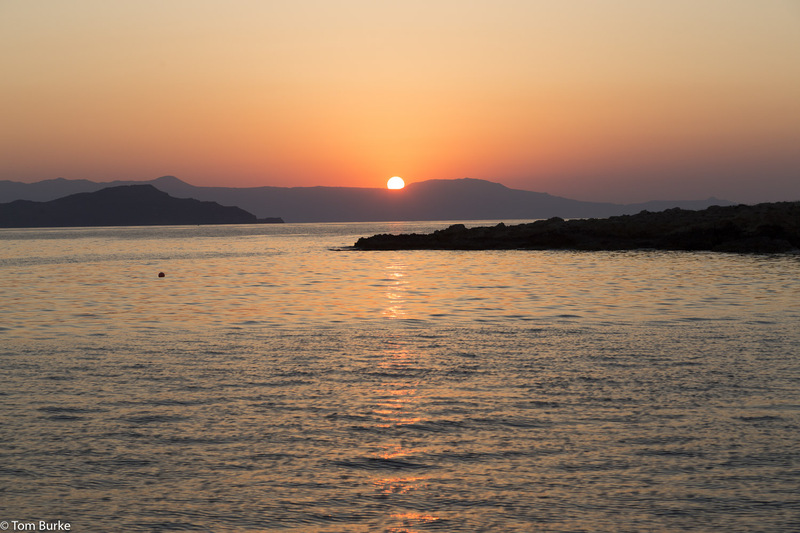 Yesterday I had a final morning in Paleochora before heading to Chania on the midday bus. (That makes it sound a bit like a western – ” he’ll be on the midday stage, boys”.) It was two hours back to Chania so I was checking in at the Casa Delfino at just after 2 o’clock. I got there from the bus station by taxi – it’s not that far, perhaps half a mile or so, but given the heat I decided that turning up at a classy joint not looking like a puddle of sweat would be good. I’ll write more about the Casa Delfino later, but in summary it’s a stylish boutique hotel constructed out of several Venetian era houses arranged around a courtyard. It’s quite pricey, but the service is very good – there are lots of staff who seem to speak several languages. Among the various facilities of the hotel is a Spa. I was quite prepared to give this a miss, but I did look through the list of treatments and one caught my eye: “After Samaria Gorge”. Well, I had to try that. I’ve never had a spa treatment before, so this was all new, and I was a bit uncertain of the procedure. But I had a shower first, then put on underwear and a (supplied) bath robe, and went down to the spa. Everything was very proper. The masseuse explained how I should arrange myself – lying face down, naked, but covered with a towel. Then she absented herself for a minute while I made it so. Then she returned and started torturing me the treatment. First I received an all-over massage, back and front, and I suppose this lasted maybe 20 minutes or so. (The turning over onto my front was done very efficiently – she lifted the towel up and held it in front of her face, told me to turn over, and when I had done so she simply laid it down across me.) After the full-body massage she spent a lot of time on my calves and thighs, because I had indicated that these were hurting following the walk on Thursday. This lasted a good 20 to 25 minutes, and was quite painful at times – she was definitely giving my various muscles in those regions some stick. Finally the treatment finished with a 15 minute or so foot massage, which I have to say was delightful. All in all the treatment lasted for 70 minutes. I certainly knew I’d been treated – I fairly hobbled out, smelling of essence of grapefruit (the aroma I’d chosen at the beginning). As to whether it was effective – yesterday evening my mobility, especially going down steps, was worse than it had been before the treatment (the result of that early steep descent down the steps on the walk) but today everything is a lot easier. Later in the afternoon I wandered around Chania reminding myself where everywhere is, then (after another shower) went out to dinner at about 8 o’clock. I’d reserved a table at a restaurant I’d loved last year, Kritamon, which was newly opened at that time. In the year since it has apparently changed hands. The food was as good as ever, but their wine policy has changed; there are now very few wines by the glass. And prices have increased – my meal, including two courses and a couple of glasses of wine, came to €30. Compare that to €10.50 in Paleochora. That said, the meal at Kritamon was better. After that I strolled around the harbour area for a while before coming to rest at Nama, a bar that does good music and excellent wines, where I had another glass of wine before calling it a night at about midnight and heading back to the hotel.